HomeWhite Ledge and the Winner of the Colonial Knife Giveaway! White Ledge and the Winner of the Colonial Knife Giveaway! 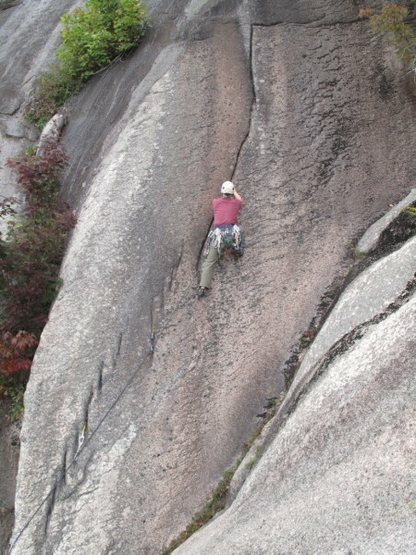 The last couple weeks have been excellent for climbing with dry conditions and minimal bugs! 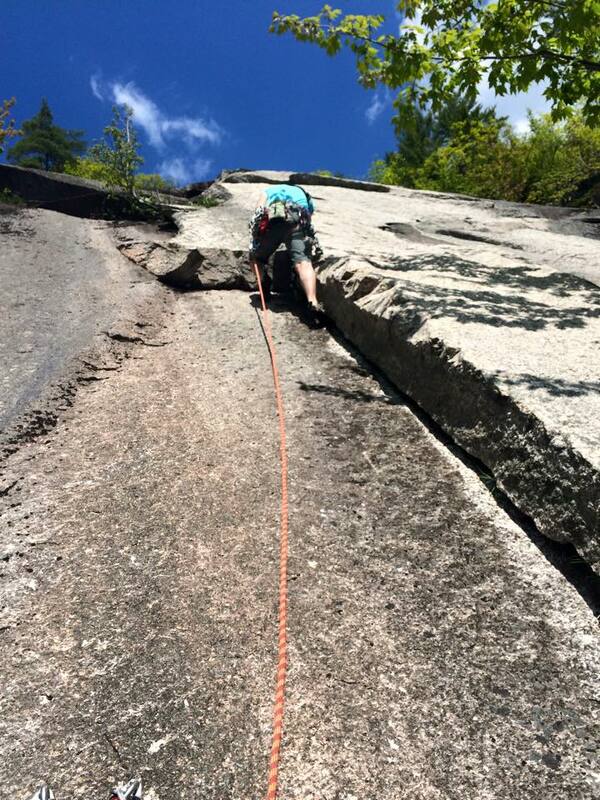 After guiding two days last week, once at Cathedral and another at Square Ledge, I hooked up with AMGA Certified Rock Instructor and fellow EMS Schools Guide Anne Parameter for a quick day trip out to White Ledge in Albany. Anne had visited this cliff once before but wet conditions kept her and her partner grounded. This past Friday conditions were bone dry and perfect for a quick linkup of some of the new classic pitches that have cropped up here. Pitch 1 of Manifest Destiny. A couple of bolts protect a short 5.8 face section. We then stepped left and enjoyed the classic 2nd pitch of Old Route. Halfway up this pitch we merged into the 2nd half of Pitch 2 of Go West Young Man and belayed at its end at a gear anchor. I took the 3rd pitch of Go West, then Anne got us through the headwall, and I believe, merged back into the more mellow Go West 4th pitch after pulling a tough move more directly inline with the tree & bolted anchor at the top. I’m asking the FA’r, Brad White to verify if we were either on or off route here. We only had a 70m rope which I think is pretty much required (unless you bring 2 ropes). One rappel back to the tree, another to a bolted anchor on Eminent Domain (full 35m rappel). Another to the bolted anchor on Old Route. And one more to our packs. 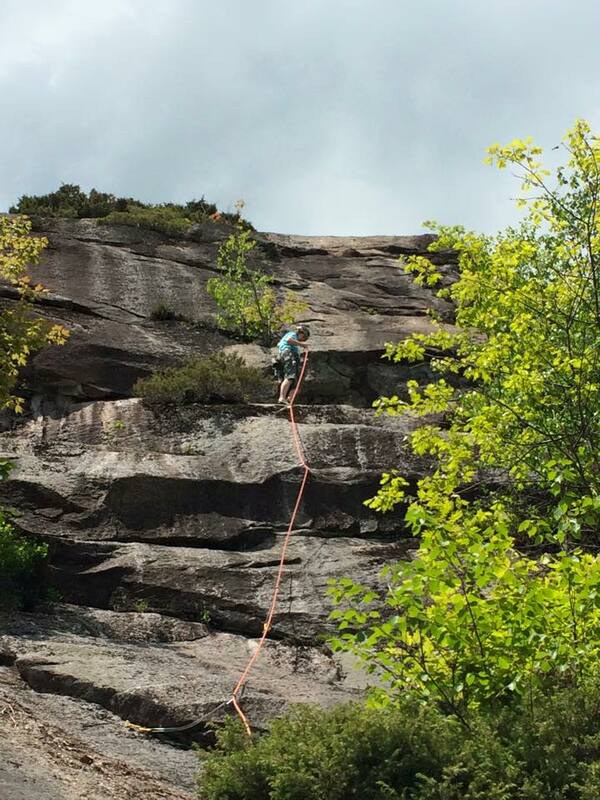 Anne cruised the 5.9 3rd pitch through the steeper upper wall. There is a short moderate pitch after this but we decided to head down. With just the one rope that meant a bit of adventure rappelling down to a big pine between the Main Wall and the Right Wing area. Another rappel from here brought us to a fixed station on a large tree above the crags only sport route, White Riot. From there down to the bolted anchor on Go West, then one more to the deck. 7 pitches and 8 rappels and we were done by 2pm hiking out. This cliff is really awesome. It’s incredible it was largely left undeveloped until the efforts of Brad White & Matt Peer starting in 2011, and continued by the Chinos Mtn. Club. If has the feel of an outback cliff but is really only 35-45 minutes from the road. There’s definitely some more route potential and hopefully more traffic will keep things clean (it’s a surprising clean cliff to begin with). Get out there. Check it out! And now, the winner of the Colonial Knife Review Giveaway! Congratulations to Vinny of Bear Bait Baits Bears Blog. Other than having one hell of a tongue twisting blog name this AT Thru-Hiker had the good fortune to be drawn from 17 entries in this contest! Colonial Knife has provided me with a few more knives so we’ll be doing this give-away again soon! Stay tuned and see you in the mountains!